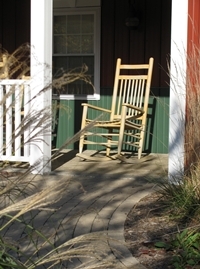 TimberCreek Bed and Breakfast "Sophisticated Country Accommodations"
TimberCreek Bed and Breakfast is an upscale Christian country Bed & Breakfast. 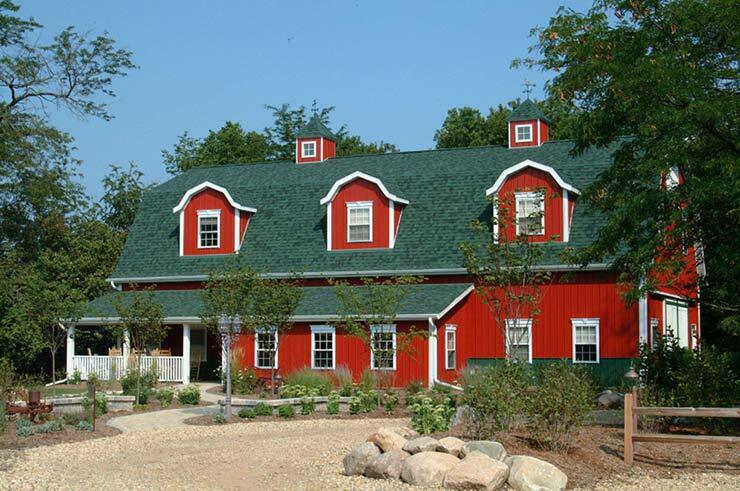 Instead of an old Victorian home on a city lot, TimberCreek was purposely built in 2003 to look like a barn on a 25 acre gated property just outside Paxton, IL. The Inn is situated at the end of a long winding lane in a secluded meadow surrounded by trees and a stream. It is the ideal setting to escape fast-paced everyday living to relax, recharge, and reconnect with each other. The interior of the Inn is decorated in an English Cottage décor. Upon arrival, guests will find hardwood, brick, and tile floors, knotty alder wood beams and cabinetry, white pickled wood ceilings, skylights, fireplaces, private sitting areas, upscale furnishings, artwork, over-sized beds, a Jacuzzi, and much more. All accommodations have private bathrooms and one suite on the first floor is handicapped accessible. Laundry facilities, irons, and hair dryers are available upon request. The Kitchen is stocked with coffee and tea. The Gathering Room has a large stone fireplace, leather recliners, floral couches, board games, and many magazines to choose from. A bountiful breakfast is served each morning in the Breakfast Room. There is a small business center on the second floor and WiFi is throughout the building. The Breakfast and Gathering Rooms can be reserved daily for business meetings, church retreats, bridal showers, focus groups........ TimberCreek is often bustling with receptions during the Spring, Summer, and Fall months. Guests can create a fantastic time for family and friends by reserving the entire Inn at a discounted price for Holidays, U of I games, Scrapbooking, Birthdays, and Special Occasions. Outside, guests will find a covered porch with rocking chairs and a nice stone patio with a large outdoor fireplace tucked into the landscaping nearby. The patio has cushioned wicker furniture, tables with umbrellas, and wrought iron chairs and benches. Firewood is complimentary. Many guests enjoy walking along the winding lane and exploring the stream. At dusk, when the birds finish their singing, TimberCreek is transformed into a country planetarium as the moon rises over the meadow and the stars appear in the sky. If you happen to be from the city, it's simply amazing!! At daybreak, deer may be found in the meadow and wild turkeys will most likely be close by. TimberCreek is one of the most peaceful places you will ever discover. Our lovely hostess, Connie Bahler, spoils all her guests with special attention and sweet compassion. If you have never tried a Bed & Breakfast, TimberCreek is a very good place to start. My daughter and I toured the Timber Creek Bed and Breakfast this morning and I wanted to tell you that we were both completely in AWE of the entire building! My husband and I have stayed in many B&B's in several different states, and I can truthfully say I've never seen one more lovely than yours. Hats off to you in this venture, and I will SURELY be recommending your B&B to anyone who will be staying close by.